There are three different Vajra Dances which can be practised, separately or linked together: the Vajra Dance of the Song of the Vajra, The Vajra Dance of the Liberation of the Six Lokas and the Dance of the Three Vajra. In order to practice the Vajra Dance of the Song of the Vajra and the Dance of the Three Vajra the practitioners should have received in particular the transmission of the Dzogchen Teachings from a Dzogchen Master and the transmission of ‘lung’ of the Song of the Vajra. For someone who is really interested in practising the Vajra Dance but who has not had the possibility to receive the transmission of Dzogchen Teachings, he or she can learn the Vajra Dance of the Liberation of Six Lokas. However it is beneficial to have at least received the transmission of the ‘lung’ of the Song of the Vajra although it is not particularly necessary. The Vajra Dance is a meditation practice integrating movement and sound. Its principle is to harmonise and coordinate our energy and integrate all experiences related to our three existences of Body Speech and Mind into the state of contemplation, and further to stabilise and maintain the state of contemplation. Through the three main experiences of emptiness, clarity and sensation we can discover our real nature. The practice of the Vajra Dance takes place on a large Mandala of approximately 100 sq.m representing the correspondence between the inner and outer dimensions of our existence. During the Vajra Dance meditation session 12 practitioners, 6 women and 6 men can practice together. Rosa Altamirano was born in Cosquín, Argentina. In 1999 she met Chögyal Namkhai Norbu in Tashigar South, Argentina’s Dzogchen Community centre. Since then she has followed the Dzogchen Teachings and practiced the Vajra Dance. 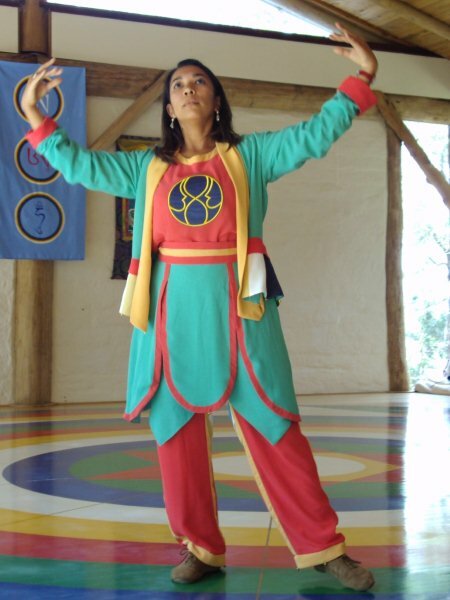 During her training she has led Vajra Dance courses and practices in Argentina, Venezuela, Peru, New Zealand and Australia. Rosa received formal authorisation by the Master to teach the First Level of the Vajra Dance in 2010 and the Second Level one year later. After living in the Dzogchen Community centres in South America for several years, Rosa moved to New Zealand where currently resides.